PIAGET REF. 15201 LADY'S POLO QUARTZ YELLOW GOLD AND DIAMOND Piaget "Polo", No. 445022, Ref. 15201 C 725. Made in the 1990's. 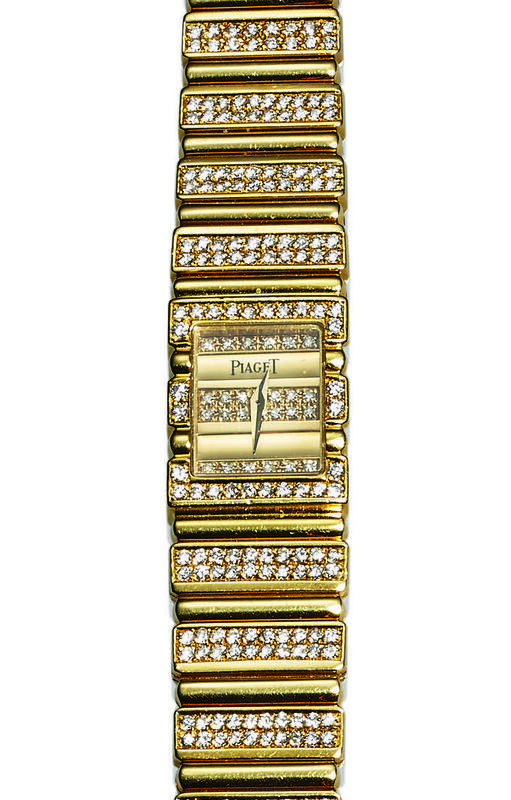 Very fine, square, 18K yellow gold and diamond lady's quartz wristwatch with an integral 18K yellow gold Piaget link bracelet set with 232 round diamonds. Two body, solid, polished and brushed, bezel set with 28 round diamonds, case back with 4 screws, bezel and sides repeating the bracelet decoration, sapphire crystal. Yellow gold repeating the bracelet design, set with 24 round diamonds. Yellow gold dauphine hands. With quartz standardization. C. Two body, solid, polished and brushed, bezel set with 28 round diamonds, case back with 4 screws, bezel and sides repeating the bracelet decoration, sapphire crystal. D. Yellow gold repeating the bracelet design, set with 24 round diamonds. Yellow gold dauphine hands. Dial and case signed. DIM. 14 x 18 mm. THICKNESS 5 mm. Approx. overall length 160 mm.